Platefuls of whit, served with talent is found. to encourage an idea you have to bear fruit. Just follow the directions posted with care. A bevy of gems, it’s paradise, a writers delight. And we have made it halfway, horray and good cheer. To celebrate wine, cake and candles to blow. And PAARRTTYY wherever you are with Julie and friends online. And everyone shimmy, virbrating the net in “Happy dances”. Trying to think of what to come up with for a party online, can be quite challenging. As I have said before, I am no poet but I just couldn’t resist throwing temptation to the wind and having ago….lol. Here it is winter now and you lot are all enjoying the summer, so I will forfeit the strapless little black number I normally would wear, and don trousers and a woollen turtleneck instead…lol. I will certainly celebrate with a bottle of white chardonay, yes that’s right a bottle, after all I am at home and don’t have to drive, yay! (make that two bottles unless I am already legless…lol). I am both grateful and blessed for the friends I have made on 12x12in12. Julie has done a stellar job in bringing us all together, from around the world with guests, resources, giveaways and loads of fun. This is a fabulous idea and I look forward to the next 6 months. Here it is customary when invited to a party to always take a plate. That is, a plate with some food on it, usually enough for everyone. So as promised I have made a cake for you all to share…… Enjoy! 70 Responses to “12x12in12 Party” Downunder! Your cake is beyond lovely Diane, and so is your poem! I especially loved this line: to encourage an idea you have to pear fruit. Here is to the next 6 months – I’ve already had my wine – LOL. I’m so honored to have you in the group. Awww thanks Julie, you always say the sweetest thing! To the next 6 months, Cheers! Cheers! Your poem and cake are fabulous! Happy celebrations! Thankyou so much Joanna. Cheers to you! Wow! What an amazing cake. I want cake now! LOL Thankyou, glad you like it…. come on over and have some…lol. Will check out your post. Wonderful celebrations Diane. Your poem and cake are brilliant! Thankyou, I hope you are celebrating to. Thankyou for your kind words. Diane, congratulations! Love your poem and the cake…..yummy! Happy Half way there!!!!! Thankyou Cheryl Glad you loved the poem and cake, cheers! Wow! Talented writer and cake maker too! LOL….. now you have me blushing Kathy…LOL. Thankyou! 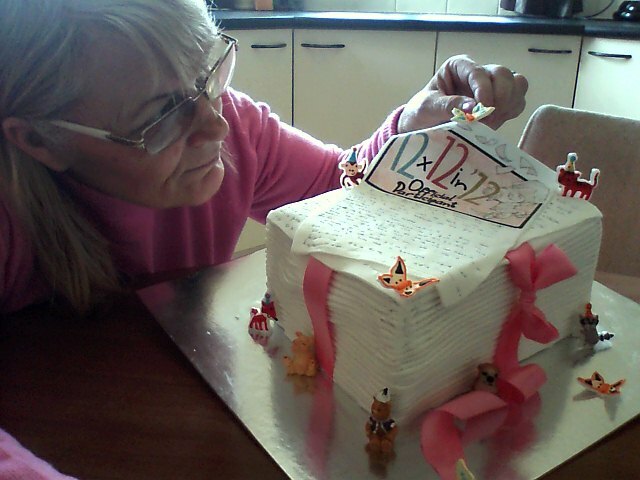 That cake is incredible looking and what a lovely poem Diane! Thankyou for your lovely comment Jennifer, Cheers to you! Fun post. Love the cake and poem Diane! Congratulations! Can’t believe it’s winter there. Thankyou so much Pat. Yes unfortunately it is winter, and we are in for a really bad cold snap! Can’t wait for summer…lol. I love the cake! And the poem! And the talk! I LOVE THIS POST!!!!!!!!!!! LOL… Thankyou Erik, so glad you loved the cake and poem! Isn’t it wonderful how we have come so far. So pleased to be enjoying this with you. 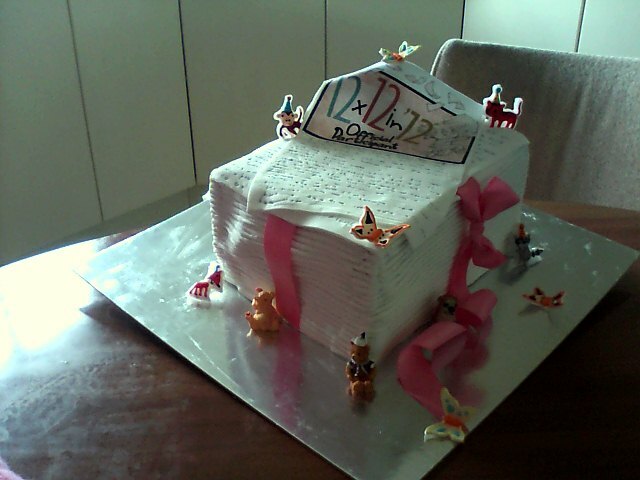 When I clicked to enlarge the cake photo, I said out loud, “Oh… Wow…” What an incredible stack-of-manuscripts cake! Happy Half-way There, Diane! Thankyou Beth, Imagine that is what 12 manuscripts would look like at the end of the year. Happy Half-way There! I’m very impressed! Awesome cake and poem! Happy 12x12x12 to you! Thankyou Tina, what lovely compliments I am receiving. Happy 12x12x12 to you too. Gotta get me some o’ that cake! LOL….. plane leaves in an hour for your 10 plus hours flight here, be on it! ….LOL. If I only had the means, cuz’ my shoes are tied and I’m ready to go! Thankyou , thats very sweet of you. Catch Julie’s flight if you like, so you can sample the cake…lol. Diane…what a great post! Your poem is such fun…and the cake looks DELISH! The best part about this 12×12 online party is NO CALORIES, even though I am having goodies on every blog. :) Best of luck and happy writing in the second half of the year! LOL….. I agree with you there Vivian about the NO CALORIES! Wish my waistline would take note…lol. Thankyou so much for your lovely comment and happy writing to you to! Mmmm. Delicious poem and cake! I don’t get to comment as often as I would like, but I’m a follower of yours, Diane. I can’t wait to see what the second half of the year brings! Thankyou so much Hannah, so glad you liked this post and I am delighted to hear you are a follower. Yeah, me too, can’t wait…lol.! Wonderful poem and yummy looking cake! And 12 completed??? You need to party, girl! LOL… NOoooooo I haven’t completed 12, this is to show you what 12 completed looks like… well, roughly what it looks like…lol. Sorry Penny, guess it is a bit missleading…lol. Thankyou Romelle glad you like it, Happy 6×6 in 2012 to you! thanks for dopping in, come back anytime! Wow! I’m impressed. You created a lovely poem and to top it off, a gorgeous looking cake! Happy 12 x 12 in 2012 Halfway Mark! Oh, my goodness, the CAKE! Such talent! I gasped when I saw the enlarged photo and my sons came running to see what caused it. We are in awe of your skills. The poem is sweet and I hope you enjoyed your wine all bundled up warm and cozy. Happy halfway! LOL….. awww… Thankyou for your sweet words. I wish I could have passed you a few pieces through the screen to share with you and the boys. As long as I am warm that’s the main thing. Happy halfway to you to, and lovely to hear from you Heather. It’s such an accomplishment to even get one manuscript written, so congratulations on your milestone!! I enjoyed reading your poem, too! And hope you enjoyed your beautiful cake. Thanks for sharing! Thankyou karadhya, welcome and happy halfway to you to. Do pop back anytime. Gid’ay Mate! Thanks a whole bunch! Glad you are having fun, Mate! Keep on partying….. lol. You speak well.. Your cake is very impressive! Thanks for the poem too! It has been fun reading how everyone is celebrating. Good luck during the next six months! Thankyou so much Eric, so glad you are enjoying this post along with all the others, have a swell time and all the best to you too! Oh, My! Delightfully awesome cake!!! And then you topped it off with a poem–you must have more energy down under!! Thanks for inviting us to your party! And Congrats! Your CAKE rocks and so did the POEM! 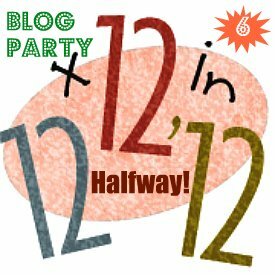 Happy Half-Way Mark via the 12x12in2012 Picture Book Challenge!!! LOL…. thankyou so much, Happy Half -way there to you to Enjoy the fun. Thankyou so much Donna, Happy writing to you to, my friend. Hi Diane! Thanks for the cake! Loved the poem. Hooray! Here’s to the next 6 months! Hi Loni! Lovely to see you here! Glad you like the post and cake, cheers for the next 6 months. Come back anytime. Whoot! Congrats on completing 12mss. OH! Rena, no, no…. LOL That is what 12 manuscripts will look like but I am only halfway there….lol Let’s see what the next 6 months bring! Happy Half Way and good luck with the next 6! Thankyou so much, glad you are joining the party… cheers! I am so impressed by that cake! You deserve some kind of prize! But, you do have all our affection and admiration! Awww…… thankyou Deb that is so sweet of you. Enjoy the party! Thankyou Lynn for your kind comments. Glad you enjoyed the party! Thankyou for your kind words. Hope you are enjoying the party! Thankyou Jarm for your kind words. Ohhhh yes wouldn’t it be just great! What a party that would be ….lol. Your’re very welcome, call in anytime. I was thrilled by the poem and then cake! Very lovely. I can’t wait to see your 12 manuscripts. I promise I won’t eat them, just a tiny corner of the cake. LOL 🙂 Woohooo…..Glad to see you are enjoying the party. Come back anytime Stacy! Love that cake! Great party post, and enjoy your ‘wiinter’…it’s a hot hot muggy miserable summer (weather-wise) in southeast Arkansas, USA. To bad, but our wine is boiling at room temperature. Ohhhh …. too bad about the warm wine. Glad you enjoyed this. Winter is winter..blah! Can’t wait for summer…lol. Loved having you here come back anytime. I loved your party poem and ADORED your cake–it looks amazing! Congratulations on halfway and good luck with the remaining six months.